Falling Slowly… – music. travel. repeat. I was just put on to this song and I LOVE it. Embarrassingly enough, I have yet to see the movie “Once” that this song, “Falling Slowly”, hails from but its now moved to the top of my watch list. 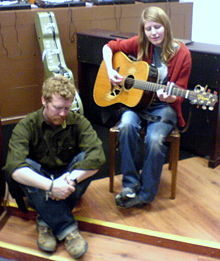 Just a beautiful love song performed by Glen Hansard, who I know from the band The Swell Season, and Marketa Irglova. Take a listen and put this on your Sunday afternoon mix. Also, for the heck of it I found a version of this song with Hansard accompanied by Eddie Vedder, so check that out below. Next Post Next post: When was the last time you went busking?? ?